M83 - Hurry Up, We're Dreaming. Hamasyan named the album in tribute to his hometown of Gyumri, Armenia, where he was born in 1987 before relocating with his family to Los Angeles in 2003. He currently resides in Erevan, Armenia. 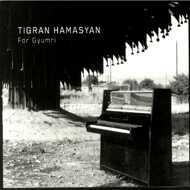 Hamasyan began playing piano at the age of three and started performing in festivals and competitions when he was eleven, winning the Montreux Jazz Festival’s piano competition in 2003. He released his debut album, World Passion, in 2005 at the age of seventeen. The following year, he won the prestigious Thelonious Monk International Jazz Piano Competition. Additional albums include New Era (2007); Red Hail (2009); A Fable (2011), for which he was awarded a Victoires de la Musique (the equivalent of a Grammy Award in France); Shadow Theater (2013); Luys i Luso (2015); and Mockroot (2015), for which he won the Echo Jazz Award for International Piano Instrumentalist of the Year. In addition to awards and critical praise, Hamasyan has built a dedicated international following, as well as praise from Chick Corea, Herbie Hancock, and Brad Mehldau.